Noah Tester of Wauseon (14) attempts a reverse layup as Austin Wiemken of Archbold goes for the block. The Blue Streaks bested the Indians, 56-50. Elijah Zimmerman of Archbold, right, drives to the hoop during Saturday’s non-league contest against Wauseon. Trent Armstrong of Wauseon puts up an off-balance shot Saturday versus Archbold. He finished with 13 points for the Indians. At halftime, it appeared as if Archbold was going to run Wauseon out of the gym. 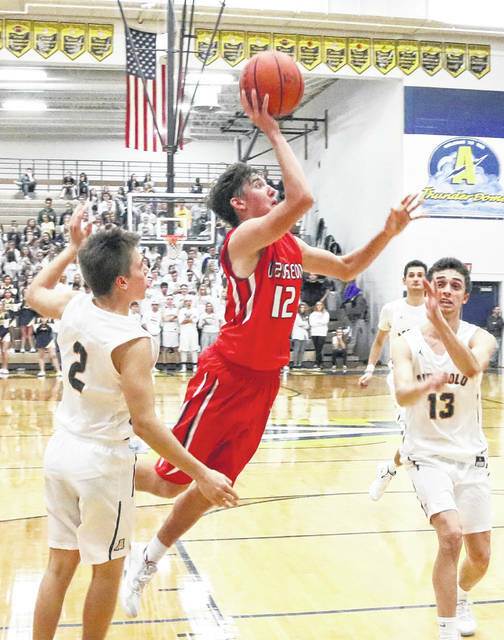 While Archbold held on to win the boys non-league opener against the Indians, the Streaks needed to hold on after Wauseon got back into the game with a big second half run. 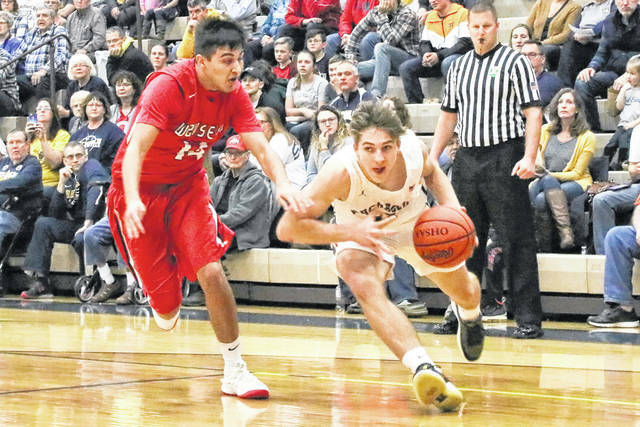 The Indians even took the lead, but thanks to free throws down the stretch from Jeron Williams, the Streaks took the boys basketball season opener Saturday night in Archbold, 56-50. The win was the first for longtime assistant Joe Frank, who took over the Archbold program from Doug Krauss. The second half was a complete reversal from the first half for the Indians. Down 34-18 at the half, the Tribe went on a 17-4 run in the third period to cut the deficit to 38-35 by the end of the period. After plays from Levi Seiler and Trent Armstrong, the Indians took a 41-38 lead early in the final period. Archbold did battle back. Andrew Hogrefe knocked down a triple with 6:25 to play to knot the game once again. 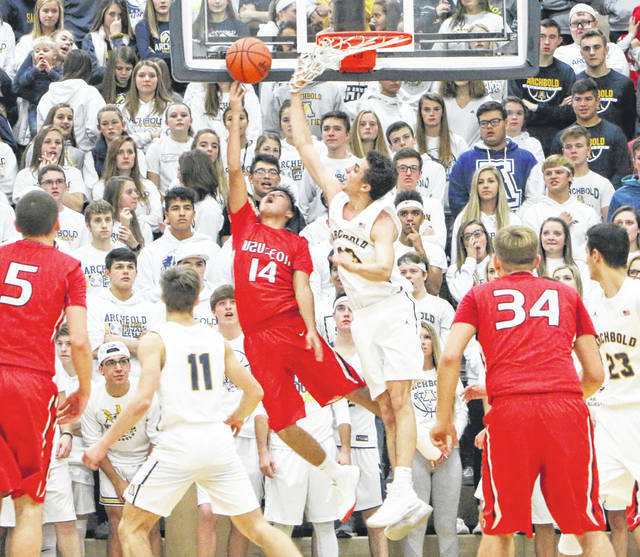 The game went back-and-forth, but Archbold’s ability to get inside and get to the free throw line took over. The Streaks got a stop on defense in the final minute, then Williams was able to stretch the lead out at the free throw line. Different defenses could not stop Archbold in the first half. Trying a man-to-man, a 1-3-1 and a 2-3 zone, Rigo Ramos had an answer each time as he buried four treys in the first half on his way to 14 points by the break, where the Streaks led 34-18. Ramos led Archbold with 17 points in the win. Elijah Zimmerman and Austin Wiemken each added 10 points. Seiler led the Indians with 15 points. Armstrong added 13 and Sean Brock had 10. Each team had a game this week get postponed. Archbold was to play at Edgerton Thursday, but that game has been pushed to Feb. 5. Wauseon was to play at Genoa Tuesday, but that is now Feb. 19. Both teams play Saturday as the Streaks visit Kalida and the Indians will host Fairview.